Life is really busy, but sometimes I just want to be able to sit down and take time to learn new things. Recently, I’ve developed an interest in the field of physics. In high school and college, I studied lots of biology and chemistry, I even studied a lot of Calculus, but I never signed up for a physics class. Honestly, at the time it just seemed so boring. Now that I’ve been adult for a while, however, I’ve started to find it really interesting. Physics is tied to everything in life, and I wanted to learn more. Thankfully, I found Neil DeGrasse Tyson’s book Astrophysics for People in a Hurry. This book was so well-written and it made learning fun. It had a light, conversational tone, but I never felt like it was trying to “dumb down” the study of physics. I never thought it would be so easy to learn about quantum mechanics and quarks and black holes. 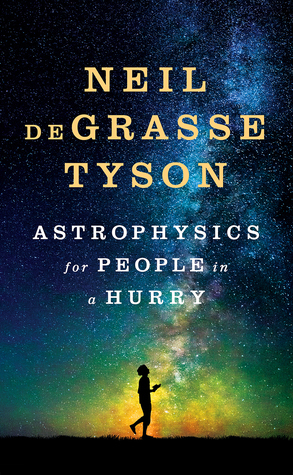 This book tackles big questions too, like: “What is the nature of time and space?” If you’re at all interested in this subject, I would highly recommend you give this one a try, especially if you’ve found physics to be intimidated before. In under 250 pages, you will learn a whole lot more than you expected!